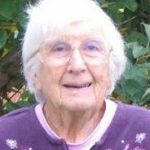 Iris Janicki of Kamloops BC passed away peacefully on July 16, 2017 at the age of 91. Born Iris Trueman on December 6, 1925, she lived and worked on the family homestead in Dragon Lake, BC. In 1953 she married George Janicki and moved to Kamloops, BC where they raised their son Philip. Iris was secretary of the Dragon Lake Women’s Institute for six years. She was active in the Kamloops Chapter of Women of the Moose for over fifty years, and she held a Star Recorder Degree. She was a life member of the Kamloops Child Development Society and for 21 years spent time volunteering in their kitchen making snacks for the kids. She was an active member of St. Georges Anglican Church. Iris will be sadly missed by her son Philip (Cindy), grandson Chris (Kim), granddaughter Katelynne, great grandsons Jared, Justice, Jasper and Greyson, and many nieces and nephews. Iris was predeceased by her husband George, parents Tom and Gladys Trueman, and sisters Joyce (Bill) Swanky and Mary (Earnest) Edwards.